There is, typically a rush of air from the room when a bottle of French wine from the famed region of Burgundy emerges from a cellar. Care is taken upon opening with the foil neatly scored and the cork eased out of the neck as if all actions are done in tribute to sacrificing what must be a grand bottle of wine. We all must assume as much given that “Grand Vin de Bourgone” is usually writ plainly and without a hint of irony on the label in a space near the year. It is to imply that potentially all years, if from Burgundy are years to behold. 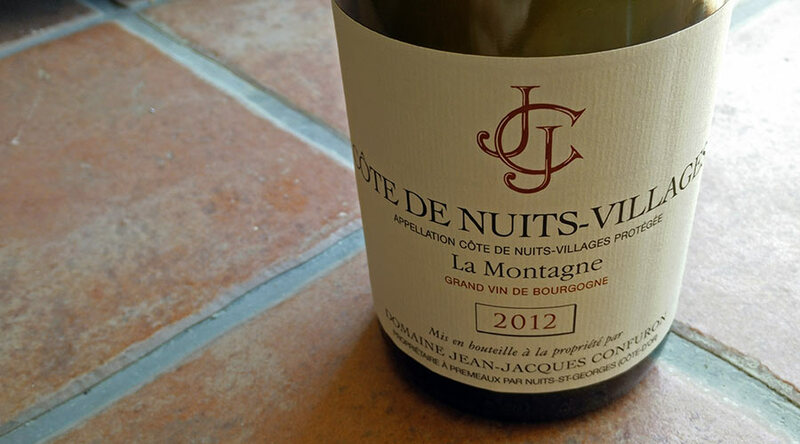 The truth is in the glass however and while it may be that fine wines from 2012 emerge from some of the villages of Côte de Nuits, this one from Domaine Jean Jacques Confuron is not one of them. Apparently a difficult vintage initially that leveled out in the end to produce good wines, this wine seems to have been cut short of the good part as it remains incredibly tight, green, and lacking depth of fruit. I’m sure that many would call me crazy for spouting such blasphemy against the sacred cow of Burgundy Pinot Noir, but in searching around, I found that other reviewers had given this wine a score of 89. I would probably even shave one more point of the Parker Scale. It’s well-made wine. It’s pleasant to drink, but there is nothing in it that elicits a higher level of interest, especially when taking in to account the price of around 28€. You can get many much more interesting wines from further south at that price level and I’m not even talking about Spain as Châteauneuf has some great bottles for 28€. There are even good Californian wines for that price and Californian wines are never what I consider to be priced well. So why did I take on this wine? Merely to expand horizons a bit in the more Northern French regions that I don’t often drink due to not finding them in Spain and their prices being six degrees past what is ridiculous. I happened to find this one at Les Figueres in Gratallops, Priorat where owner Christopher Cannan (who is also a wine exporter) has a rather nice selection of French wines in the cellar shop. Definitely worth stopping in if you happen to be dining at the lovely restaurant that graces the side of Clos Figueras. Dark ruby. Light young cherry, black pepper, very light wafts of vanilla and rose petals, medium acidity. In the mouth, tart red cherry prevalent, medium plus acidity, astringent greenness in the end of a lingering finish. Generally good balance but quite tight.